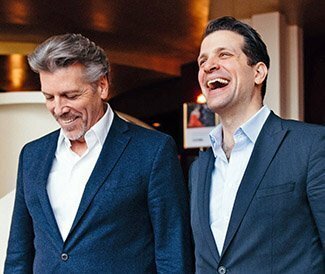 Brand-name baritone Thomas Hampson returns for his fourth Celebrity Series appearance alongside his son-in-law, bass-baritone Luca Pisaroni, with operatic and Broadway favorites in “No Tenors Allowed!” Resonance, pathos, and comedy will reign in selections by Mozart, Verdi, Rodgers & Hammerstein this Friday at Jordan Hall with Kevin Murphy presiding at the piano. Hampson boasts an opera repertoire of more than 80 roles sung in all the major opera houses of the world; his discography comprises more than 170 albums, which include multiple nominations and winners of the Grammy Award, Edison Award and the Grand Prix du Disque. he was appointed the New York Philharmonic’s first Artist-in-Residence. In 2010, he was honored with a Living Legend Award by the Library of Congress. Hampson was made honorary professor at the Faculty of Philosophy of the University of Heidelberg. Italian bass-baritoneLuca Pisaroni is celebrated for charisma and versatility since his debut at age 26 with the Vienna Philharmonic at the Salzburg Festival, led by Nikolaus Harnoncourt. If you want to learn which (if either) of the two will channel Ethel Merman in “Anything you can do…” from Annie Get Your Gun, read below the break. FLE: You’ve sung almost all of the baritone title roles in opera. Anything you’ve missed and would like to add? TH: I do enjoy a very wide range of repertoire, and have loved all my opera roles to date. I will continue to singing several of them. I suppose if someone offered me Falstaff I wouldn’t say no. I had hoped to sing Hans Sachs but that’s probably not going to happen. I do look forward to Gianni Schicchi or I due Foscari, among others. There’s so many things to learn and try right now, the most exciting development are all the new operas are being written that I have done this year and will do next year as well. There aren’t many familiar baritone/baritone duets in the opera rep, but you are singing one of the best, “Eh via buffone,” from Don Giovanni. Which one of you will play the Don and which Leporello? Will you alternate characters on the tour as some have done in the role in the opera house? There are actually probably more duets for baritone and bass-baritone than you can imagine. We are very excited to sing both the duets from I puritani and from Don Carlos, which of course are extraordinarily wonderful monuments of the opera repertoire. You may in fact find our version of the Don Giovanni duet to be very fanciful … stay tuned! Now that the University of Heidelberg has certified you as a philosopher can you tell us why there will be no tenors on stage with you at Jordan Hall? Is this anything of a complex? I’m crushed we can’t have the duet from Pearl Fishers. This is a funny question, I had to laugh on this one. First of all, I’m an honorary professor of the Humanities in Heidelberg, which means of course also Music. I’m very proud of that position, thank you! I’m not sure what that has to do with not singing a tenor and baritone duet but I get your humor. I’m afraid we’re the wrong guys for that duet – too bad! – but we’ll bring lots of other wonderful things with us to Boston. There is no philosophical statement being made about other singers or other types of singers in this concert. This is a pure celebration of masterpieces from opera and light opera by lower voices who love to sing with one another. That could even be the secondary title of this project. Opera singers sometimes transition to singing musical theater. Is that a one-way street? I’m not sure if moving from opera to musical theater is a one-way street or not. If you’re talking about a career change, it could very well be, but I think it is completely understandable that opera singers like to sing musical theater and some musical theater singers actually have fundamental training in the opera repertoire. It all seems very healthy to me for the state of vocal arts in the United States that artists are versatile and have varied interests. Please tell us a bit about why you do this show with your son-in-law. Luca and I realized early on that there were a lot of duets that we could sing together, and we very much enjoy sharing the stage. Building the program or programs that we do around the world is actually quite fun and fairly easy to do, because there is so much repertoire we can share. Concerts like these are a celebration of the great repertoire that we sing as classical artists. And on top of that just a joyous combination of talents, Luca and I enjoy one another’s very much in concert and on stage. The scheduled show ends with the famous duet “Anything you can do…” from Annie Get Your Gun. Which of you will play Ethel Merman? When we do a famous song like “Anything you can do,” I don’t think we’re so preoccupied with who originally sang it, or of the voice types as conveying the very funny content of the piece. It’s a little bit like singing the Rossini’s cat duet, regardless of who it was written for.